Mr Richard Asamoah Boateng is a social business entrepreneur. He is the founder and managing director of Rasaboat Ghana Limited. He has an inclination and passion towards sustainable environment. Richard has worked with rural water delivery services for the past five (5) years and helped in the eradication of guinea worm infested rural communities in Ghana. 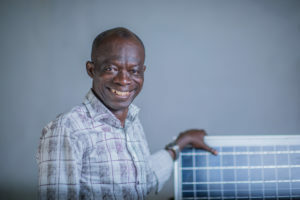 His stanch passion for the environment culminated in his Research and Development of environmental mitigation projects like inverter -based power back – ups, solar lanterns and the flagship product (An all rounder solar home system). Rasaboat Ghana Limited envisions a future where everyone in the off-grid communities would be empowered through the use of Solar Home System to offset the use of kerosene lamps for a cleaner, affordable and reliable energy source. Their tailored Solar Home System (SHS) has a prepaid meter embedded in it to function as a Pay-As-You-Go (PAYG) system where the beneficiary of the system pays about one twentieth of the total cost of the system and immediately has access to the SHS.